Burgess, playing a solo set at Reading Festival, said Brookes' passing had been undeniably tough, and has described him as "one of the finest drummers ever". Brookes, whose funeral was held last week, had played on their new album, which is set to be released next year. The singer, performing on the Festival Republic stage, said before his set: "We have to get together and sort out the future. "We're going to get together in the next couple of weeks. We've been writing, and Jon's played on the album. We're just going to have to write and record the new album and with a bit of luck it will come out next year." Burgess, who first played at Reading with The Charlatans in 1992, described it as being an "iconic" festival and said he planned to watch Eminem headlining. He performed an acoustic version of the band's hit The Only One I Know during his Reading set. He said: "I like the idea of dismantling something and building it back up with twigs and gold leaf." Burgess admitted his solo music was a step away from The Charlatans and that it had a different fan base. 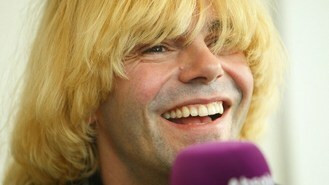 "It's going to alienate people who like The Charlatans, to a certain degree," he said. "But that's what I wanted, to push people away at first and then see if they come back and give it a second chance." He added that his solo output, including most recent album Oh No I Love You, allowed him to do "something personal".